ISLAMABAD, Pakistan (CNN) -- A top Taliban leader in Pakistan is buying and selling children for suicide bombings, Pakistani and U.S. officials said. 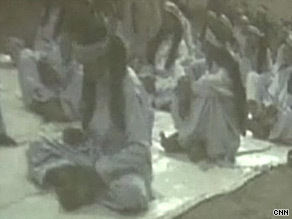 Children are shown at a training camp in this video footage shot by the Taliban. Taliban leader Baitullah Mehsud has been increasingly using the children in attacks, the officials said. A video released by Pakistan's military shows the children training for the task. In the video of a training camp, children can be seen going through exercises. Some of the children are as young as 11, the officials said. "He has been admitting he holds a training center for young boys, for preparing them for suicide bombing. So he is on record saying all this, accepting these crimes," said Major General Akhtar Abbas, spokesman for the Pakistani army. The young suicide bombers may be able to reach targets unnoticed, the military said. "If he is approaching on foot, there is a possibility he will bypass security," Abbas said. "In certain areas, there is a possibility in the population centers everyone can not be checked physically, so he can create havoc there." Pakistan has launched an offensive against the Taliban, started in the Swat region of the North West Frontier Province. The Taliban have countered with a spate of suicide bombings, including a July 2 attack in Rawalpindi, in which a suicide bomber on a motorcycle struck a Pakistani Defense Ministry bus. At least one person was killed and 29 others were wounded. Pakistan's army said it is hunting Mehsud in the hopes that the supply of suicide bombers will dry up after the Taliban leader is captured. Meanwhile, a suspected U.S. drone attack killed at least 12 people and wounded five others in northwest Pakistan Tuesday, Pakistani officials said. The missile strikes in South Waziristan targeted a suspected Taliban hideout at a madrassa, or Muslim school, in Zangarah, according to intelligence officials. The attack near the border with Afghanistan involved a pair of missiles shot from an unmanned drone, local resident Janbaz Mehsud told CNN. He said all the dead and wounded were Taliban. A local government official, who asked not to be named, said the madrassa was a training center for the Taliban and belongs to Baitullah Mehsud. That official put the death toll at 14, but said the number of dead could rise.